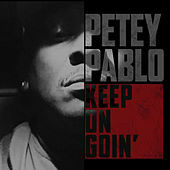 Stepping out of Greenville, N.C., Petey Pablo first turned heads with verses on Mystikal's Let's Get Ready and Black Rob's "Whoa" remix. Known for his intense delivery and amped flow, he released his debut solo album Diary Of A Sinner: 1st Entry in 2001, fuelled by the rambunctious lead single, "Raise Up." In 2004, he returned with Still Writing In My Diary..., featuring the Lil Jon produced hit single "Freek-A-Leek."